It wasn’t the most glamorous road trip I’ve ever taken (especially after being up in Monterey the week before), but it had to be done. 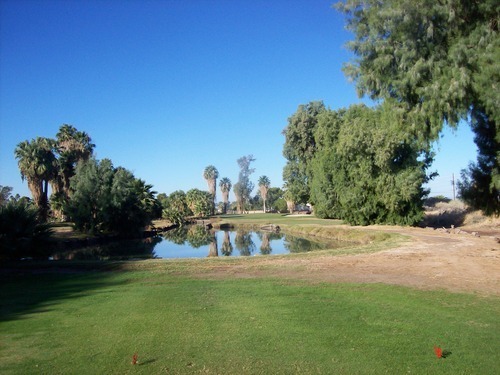 It’s no secret I have been working fast and furiously toward my goal to play all the public, regulation 18-hole courses in Southern California. As I near the bottom of my list, things start to get more and more obscure and inconvenient. 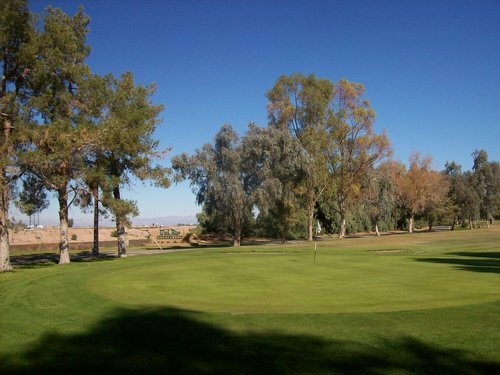 Such is the case with Imperial County, which is a place a lot of people aren’t even aware of and certainly isn’t known for its golf. Sand dune motorsports and agriculture? Yes. But golf? A resounding NO. In case you are unaware, Imperial County is the far southeast corner of California, due east of San Diego on the way to Yuma, AZ. 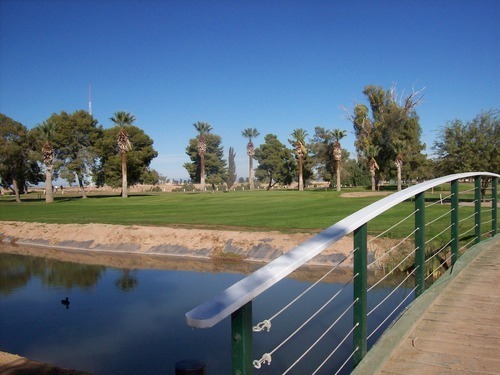 It’s pretty much a mix of desolate desert and fertile farmland near the Colorado River, so it’s easy to see why golf isn’t that big a deal there. But there are a handful of courses. Only two, though, meet my regulation 18-hole criteria. So I knew whenever I made my way out to Imperial County, I’d be able to check both off the list in the same day. Note: This resort has since its name to Imperial Palms Resort. Information online is sparse and inconsistent (and I’m not even certain the golf course is still open). In some places, the course is still listed as Barbara Worth. 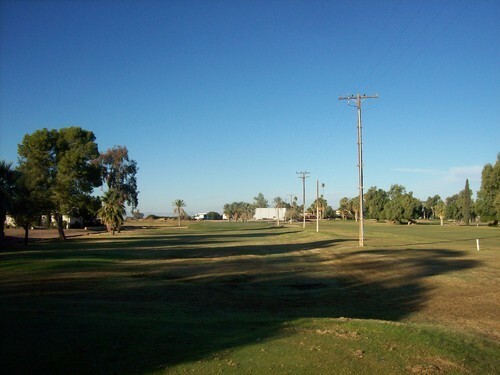 This course is about a three-hour drive from where I live, so I left home around 3:30am to be there by my 7:00 tee time. That pretty much shows the lengths I am willing to go to achieve my goal! Barbara Worth is a small little “resort” (for a lack of a better term) in the middle of absolutely nowhere. 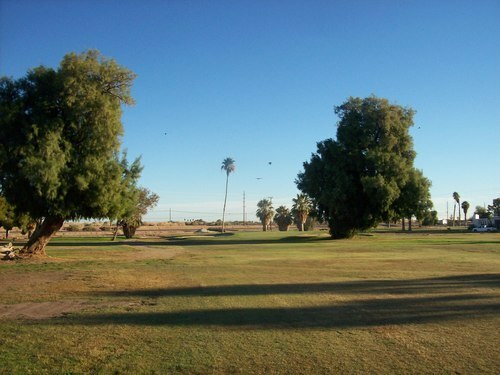 When I showed up to the course, the place was a ghost town. Ultimately, the lady opened up the pro shop and checked me in. 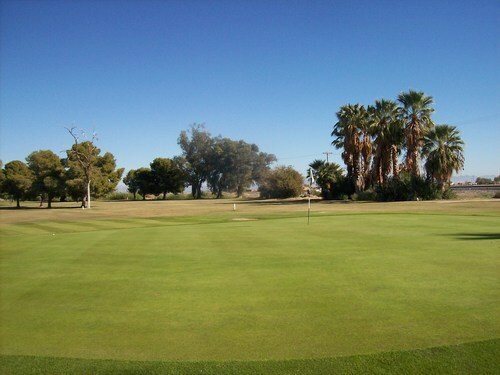 I had reserved the time through GolfNow at a rate of $30. When I checked in, she wanted to charge me the full holiday rate, so luckily I had my printed GN confirmation with me. It’s rare that any courses ask to see it, but I always have it just in case, so she had to honor that reserved price. 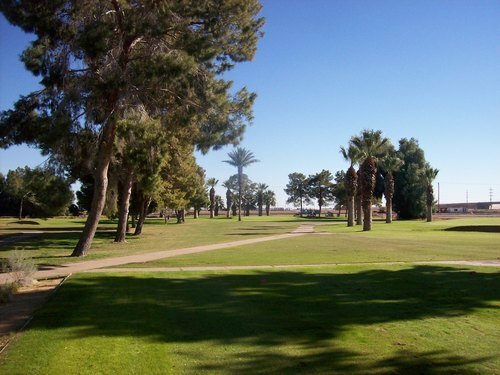 Otherwise, I teed off by myself early and it was awhile before I saw anyone else on the course behind me, so I zipped around in about two hours. 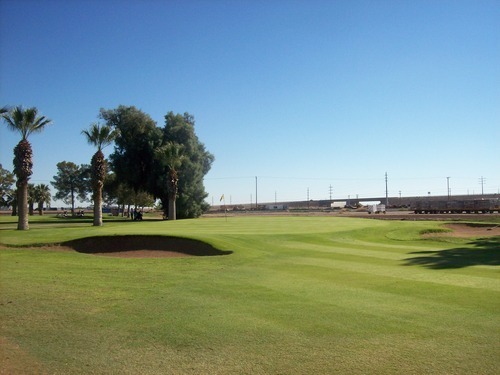 I had both Imperial County courses lined up for Thursday (the other one being Del Rio Country Club, which I will obviously review next). Heading in, I had reasonable expectations for Barbara Worth and very low expectations for Del Rio. As happens for me a lot, the result was the opposite of what I anticipated. The experience at Barbara Worth was marred by very poor conditions. This course was not in good shape. They are heading into winter, so I will give some leeway there, but Del Rio later showed me that wasn’t a major excuse. 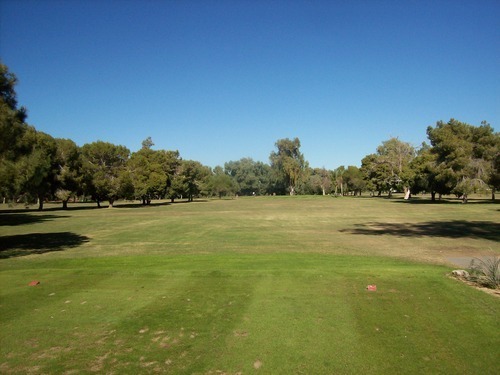 The fairways and rough were pretty ugly. 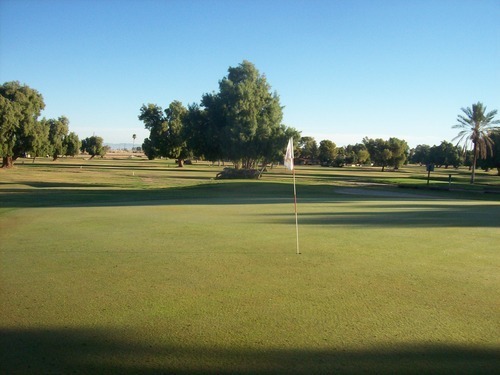 The greens were shaggy, slow and unkempt with all sorts of mud and debris on them. 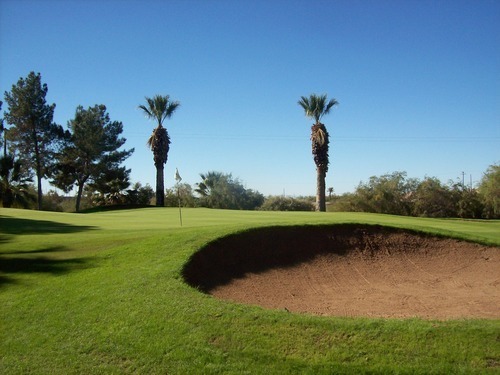 Ironically, the sand traps had fantastic sand (go figure), but they still weren’t well raked or maintained. For the price I paid and the location I was in, I didn’t set my standards too high, but I’d be lying if I didn’t say it was one of the worse conditioned courses I’ve played this year. When I played Del Rio later, someone I played with mentioned that Barbara Worth might have actually been closed for awhile due to the poor economy, so if that’s the case I will cut them a little more of a break. It’s good to see they are resurrecting this course and I’ll be rooting for them, but it does need a lot more work. The course layout itself is fine. It’s nothing too dynamic. However, it’s a solid track on and would be enjoyable enough with decent conditioning. The landscape is very flat, but there’s enough contour and diversity to keep things somewhat interesting. 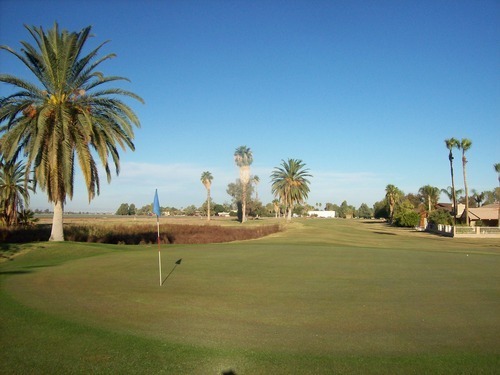 The course is mostly pretty forgiving from tee to green with some palm trees and other small trees lining the fairways to provide minor obstacles. There are a handful of little water hazards, as well. There are a couple of routing quirks that can be confusing for a first-time player. The 2nd and 16th tee boxes are literally right next to each other. On top of that the signage is a little sparse. 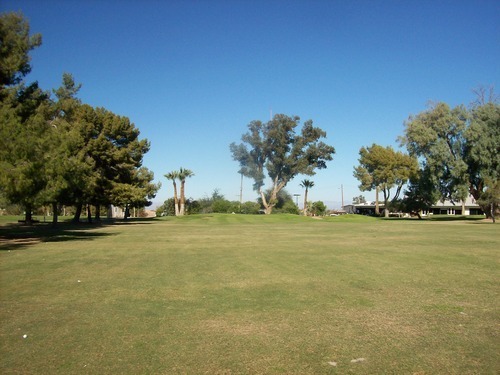 In fact, I played the 16th hole second and it wasn’t until I was trying to find the 3rd tee box that I realized my mistake. 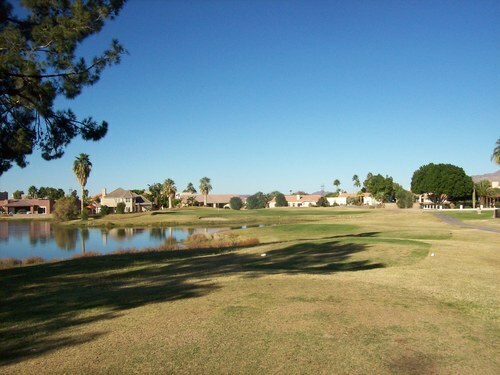 I had to go back to the tee box to reset my bearings and play the 2nd hole properly. The 9th and 18th are also right next to each other, but they are a little more clearly marked. I’m not sure what draws people to the Barbara Worth Resort. There doesn’t appear to be much to it and it really is in a remote location. I originally was looking into a stay and play package here for convenience, but they were booked through the entire weekend. I am now relieved that was the case. It looks like they did have a big Thanksgiving dinner on Thursday night. Perhaps that’s a big deal? 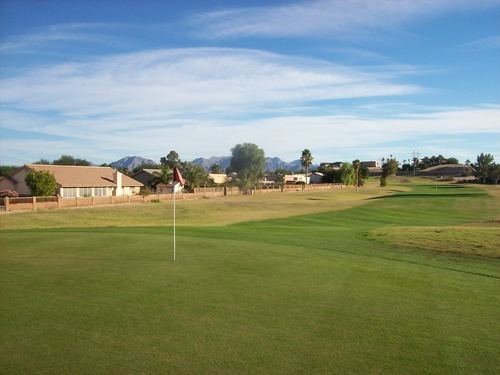 If you are in the area and need to quench your thirst for golf, Barbara Worth is there. Otherwise, it’s not worth going out of the way for. Only someone like me would make a trip out of it, but I’m glad to say I’ve finally checked it off the list. Now I know. And as G.I. Joe would say, knowing is half the battle! The white tee boxes for 2 and 16 below. I told you they were close to one another! 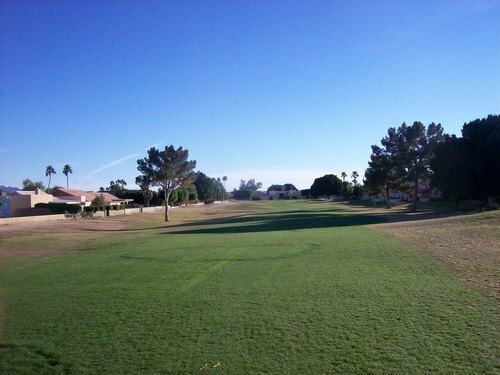 When I got to the course, I was pleasantly surprised by what looked like an okay course in relatively decent shape. It looked a little brown out there in the fairways, but it didn’t look too shabby, especially compared to what I just experienced down the road. I could see the course wasn’t too crowded and there were some scattered groups out there. I had called Del Rio earlier in the week to see how late they were open on Thanksgiving. They let me know they were closing up shop around 2:00. 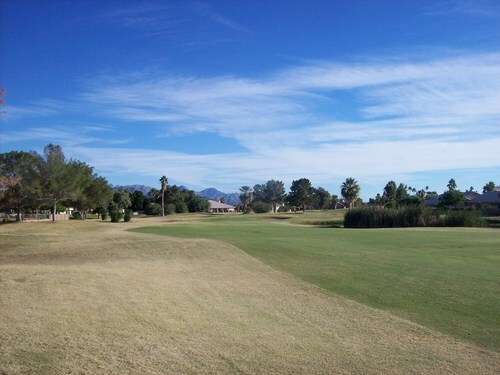 However, as long as I checked in and paid by then, the course itself was open for play until dark. That wasn’t a worry, though, because I got there a little after 9:30 and was teeing off by myself around 9:45. 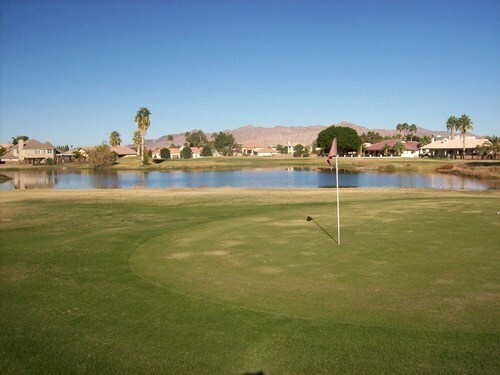 The price was $52 with cart (holiday rate), which seemed a bit steep for this course, but it was what it was. 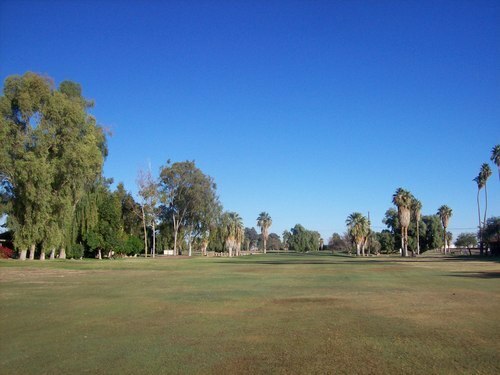 I played through one group on the front nine and otherwise had the place to myself until about the 14th hole. I joined up with a single ahead of me and later with a couple in front of us for the final holes. 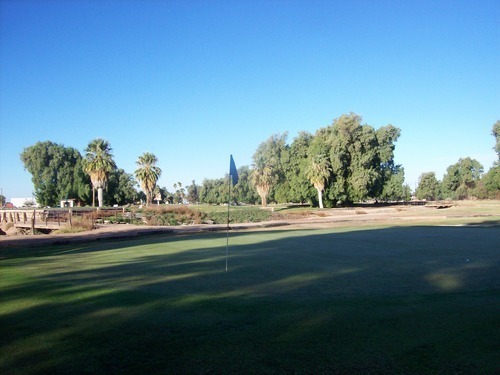 I think the last five holes took as long to play as the first 13, but I still finished the whole round in about two hours and 15 minutes. 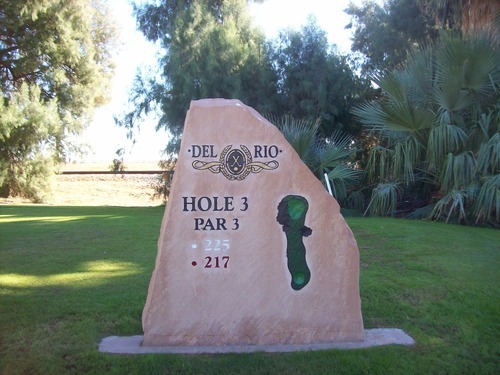 Del Rio is an okay course design. Again, it isn’t anything too exciting. 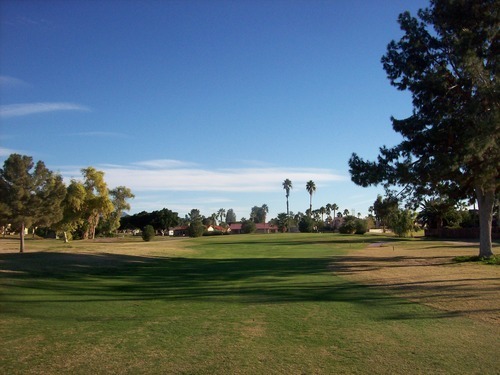 It’s a traditional parkland kind of layout with tree-lined fairways and pretty flat terrain. There are two holes, however, that provide a brief change of pace. 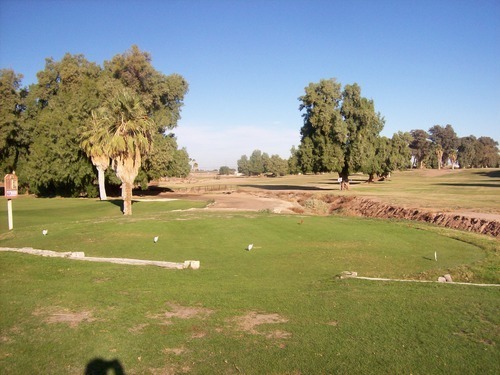 The 10th is easily the most intriguing hole in all of Imperial County (in my opinion). Okay, so there’s not much to choose from, but still it definitely caught my attention on an fairly underwhelming day of golf. It features a slightly elevated tee and looks pretty interesting. 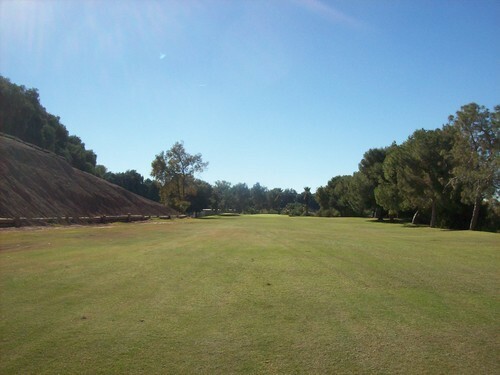 The 11th is a par 4/5 depending on where the tees are set up. 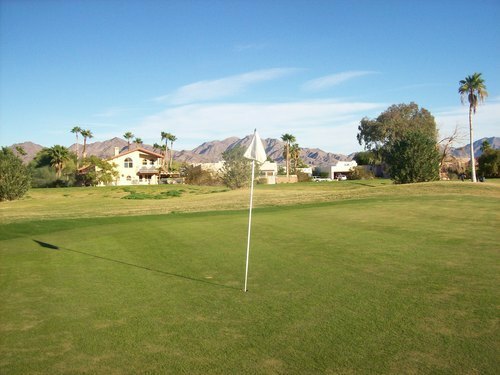 It plays down along the edge of a hillside and the green itself on this particular hole has the most undulation of any on the course. 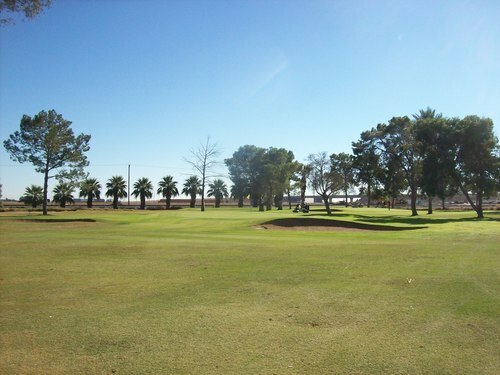 These two holes reminded me a little of Blythe Golf Course’s front nine, so it brought back memories of how that course turned out to be a relatively pleasant surprise for me. 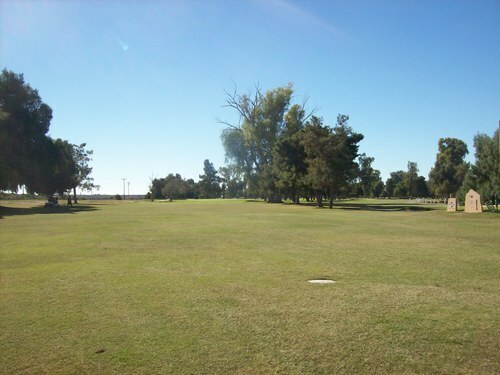 After all, I went into it with the same low expectations and because of its location and obscurity, it’s the closest comparable course outside of Imperial County. 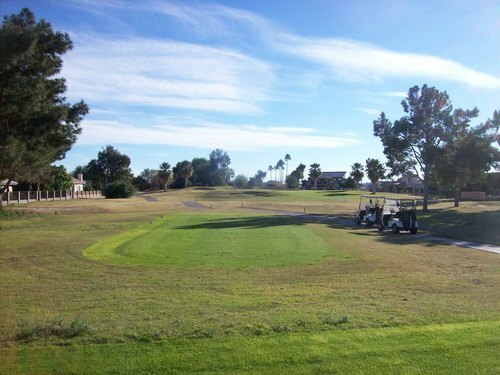 Enhancing the experience at Del Rio was the fact that the course was actually in pretty decent shape. A few of the tee boxes were a little too shaggy, but manageable. 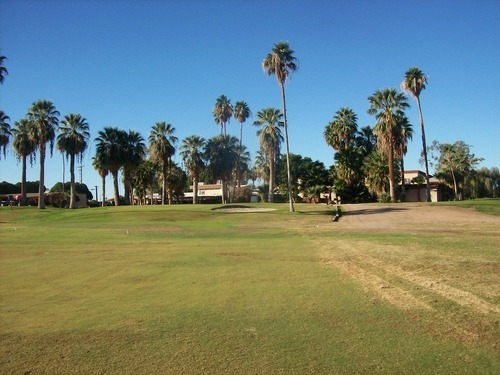 The fairways were very dried out and brown, but were cut consistently and I generally had nice lies. 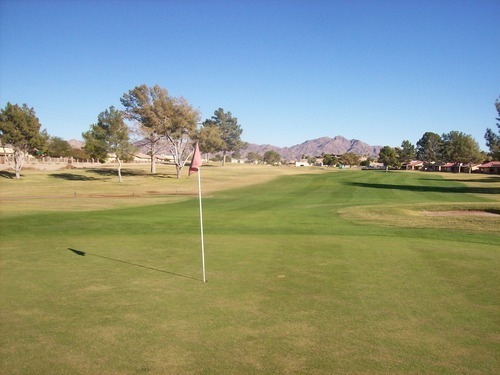 The rough was also cut level and was easy to hit from. The bunkers were good enough. The greens were very firm and rolling at medium speeds, but they were in good overall shape (except for the 17th which is clearly having some turf issues). From what I understand, they recently did some renovations here and they are moving in the right direction. A few areas still look a bit “under construction” right now, but it seems they are making good upgrades. The new tee box signs, which are huge flat-faced stones etched with the hole maps and yardage information, look very sharp. The Del Rio clubhouse is pretty basic with an old school look. 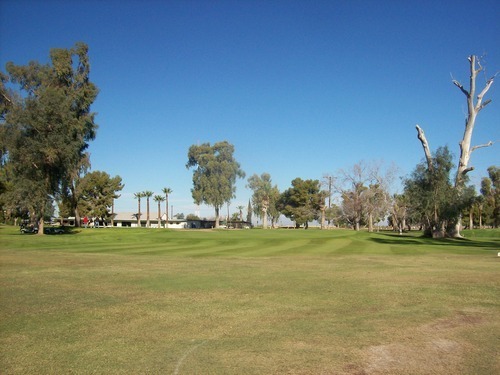 The couple I played the last few holes with were members/regulars here and had positive things to say about the course and its management. One of the reasons I was leery of this course coming in was that I couldn’t find many pictures online. If you go to Del Rio’s website, the main page header is a stock photo that is clearly not depicting a course in Brawley, CA. It looks like a beautiful course in the Carolinas or Georgia perhaps. I knew that was not at all representative of Del Rio (false advertising? ), but took the fact that they didn’t use a picture of their own course anywhere on their website to mean that it wasn’t worth showing. 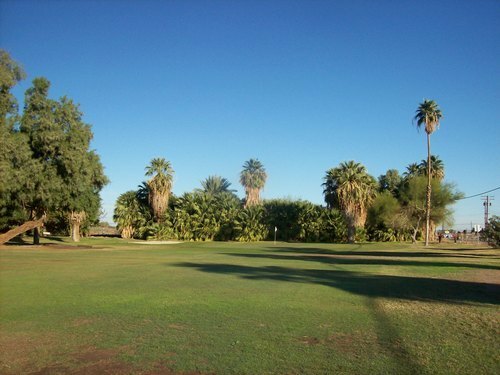 I’m glad to say I was wrong about Del Rio Country Club. That said, this is by no means a course worth going out of your way for. 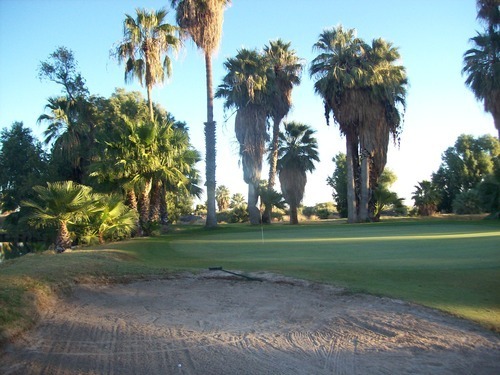 If you are driving through or staying in Imperial County for some reason and feel like playing golf, you should stop here before Barbara Worth. At this point, it’s no contest. However, if all things are equal, Barbara Worth is probably a slightly more interesting overall layout than Del Rio. 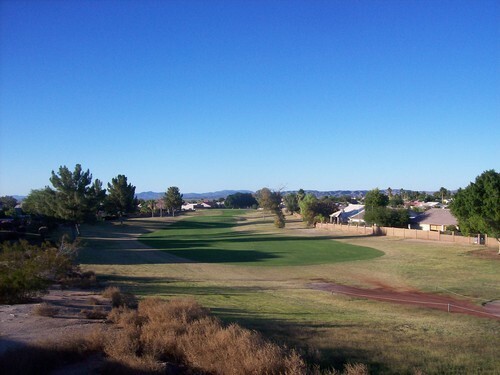 The 10th and 11th holes below. 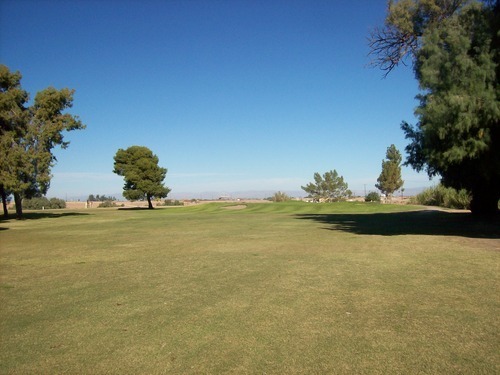 Believe me, this is as interesting as Imperial County golf gets! Originally, all I had planned to play Thursday was Barbara Worth and Del Rio. I figured that would eat up most of the day. 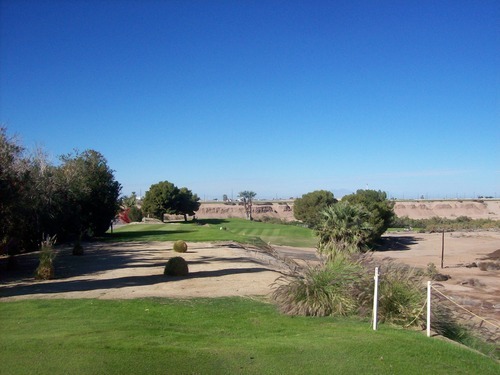 Rather than stay around there, I had opted to push a little further toward Yuma and stay at the Quechan Casino/Resort just this side of the border. It looked relatively nice and the Thursday night room rates were reasonable. It would take me an extra hour out of the way, but I knew it would give me more to do that night. The room was quite nice and the mid-size casino had all the games I like. Plus, they had a Thanksgiving dinner special in the cafe that was very delicious and ensured I got a good turkey meal while spending my holiday on the road. 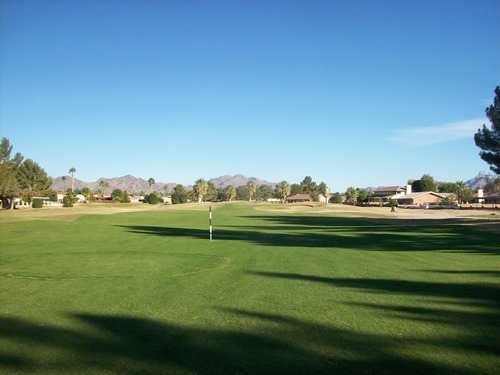 This was the only 18-hole course with times listed on GolfNow that afternoon, so it was an easy choice. The price was only $25 with cart, so there wasn’t much to lose. Also, I saw in the GN description that this was an Arnold Palmer designed course, so it at least had some good potential to be interesting. Otherwise, I knew absolutely nothing about this course. It was a blind gamble. I selected a 2:15 tee time, which gave me plenty of time to get there. I hit the road on the way to Yuma and made it there by 1:45 according to my car’s clock. I could see it wasn’t crowded and I’d probably be able to go off right away. However, when I looked at my phone and saw a time that read 2:45, I panicked a bit. I forgot that Arizona is an hour ahead this time of year because they don’t observe daylight savings! When I checked in, the guy didn’t seem to bat an eye. He took my money, gave me my cart key and sent me on my way. 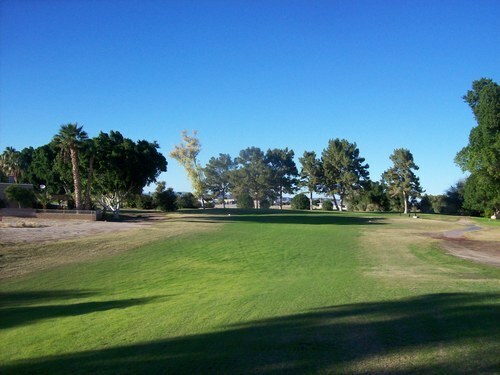 I played through a couple groups on the front nine and basically played this course in a full sprint. With the time zone issue, I really had no idea what time it would get dark, so I just hedged all bets and played as quickly as possible. 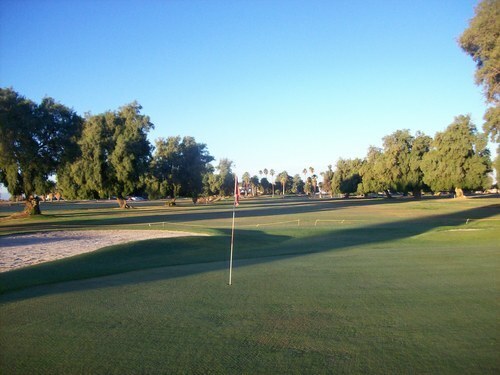 Also, there wasn’t really that much to “savor” on this course, so 1.5 hours is about all it took to complete the round. I’m pretty sure it’s the quickest round I’ve ever played! 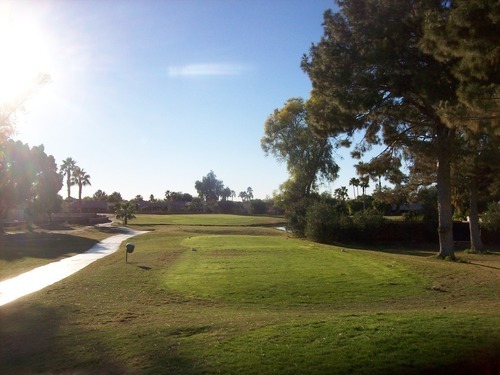 With the Arnold Palmer connection, the layout at Mesa del Sol has some obvious pedigree and you can clearly see it was a fairly well-thought-out design. 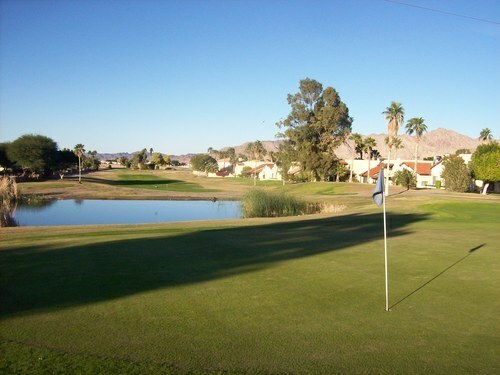 It winds through a residential community and offers some similarities to several Palm Springs area courses I’ve played over the years. Probably most comparable are Shadow Hills South and Mountain Vista, but it’s not as nice as either of those by any measure. 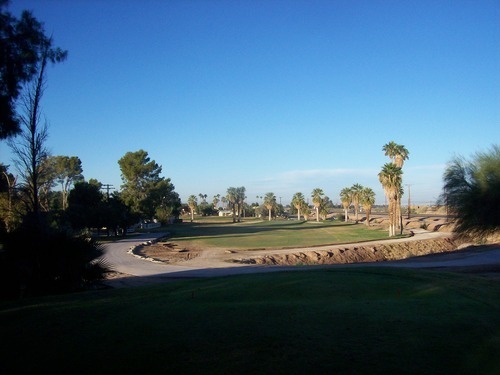 Basically, Mesa del Sol is a nice course layout, but nothing that will blow you away. 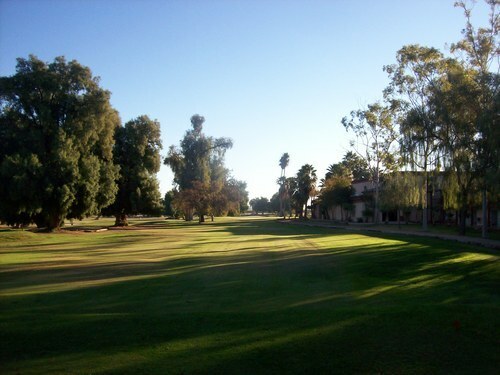 The course is pretty forgiving from tee to green. 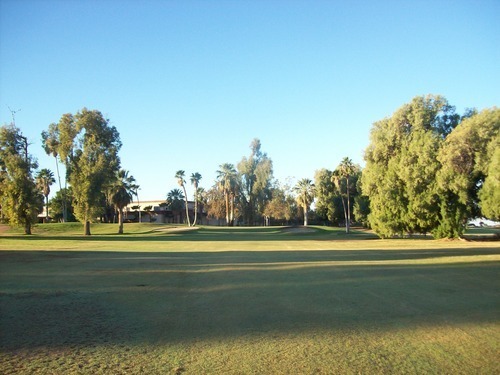 It features more doglegs to the right than most Palmer courses. He generally tends to favor a right-to-left shot shape. 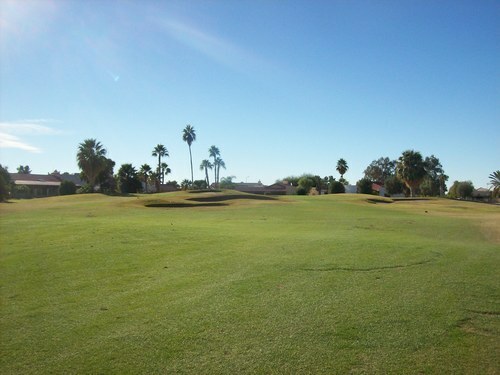 Normally, the fade-happy presentation of Mesa del Sol would suit my game perfectly, but my drive was anything but consistent on this trip, so it never worked out as well as it should have. 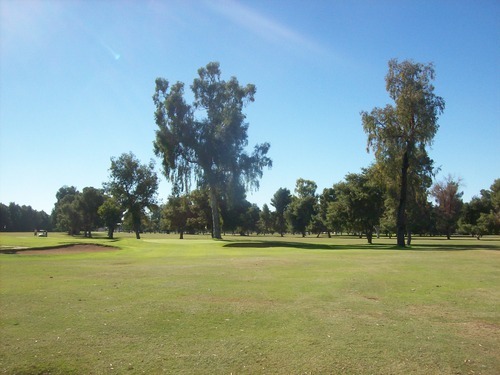 There aren’t any significant elevation changes on the course and only a small smattering of trees. 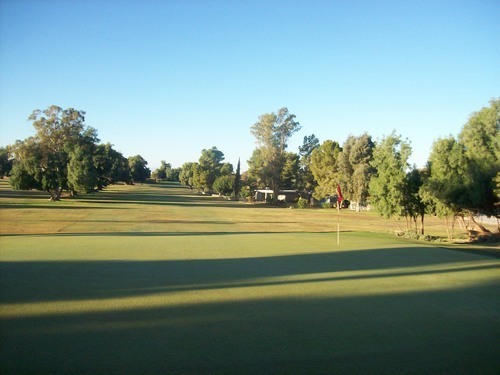 The contours are shaped by some mounding, bunkers and doglegs with fairway cuts that feature plenty of subtle twists and turns. 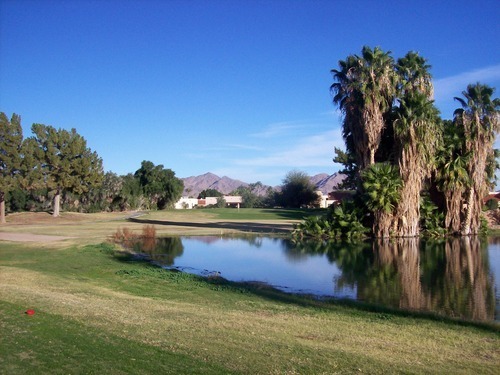 There are a number of water hazards on the course, which is common with Palmer layouts. 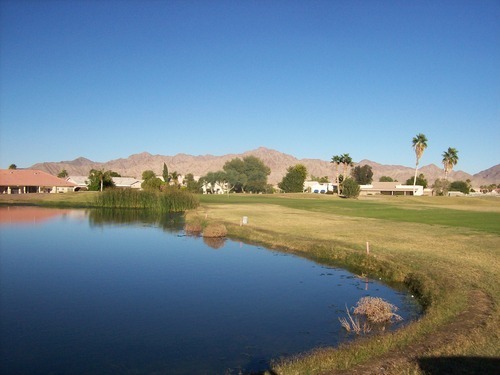 There are some desert mountains in the far distance that provide a decent backdrop in certain places. 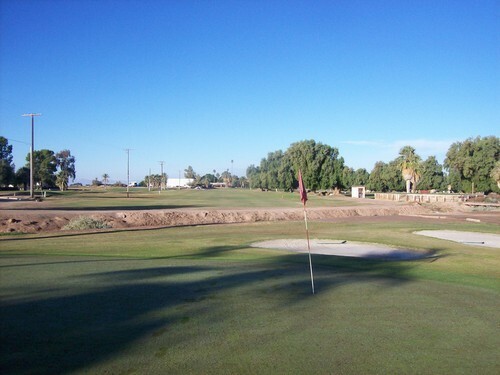 Of the three courses I played Thursday, this was definitely the best layout. However, the conditions were not that good. 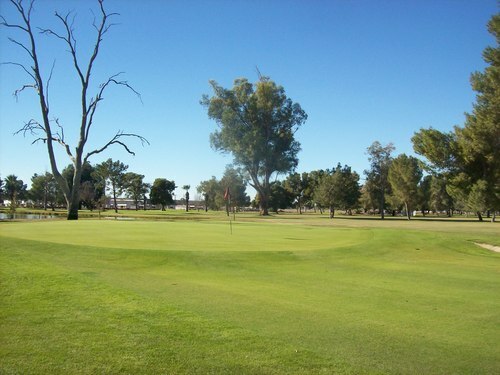 I’m not really sure when Yuma’s peak golf season is, or if they really have one since golf isn’t a huge deal here. 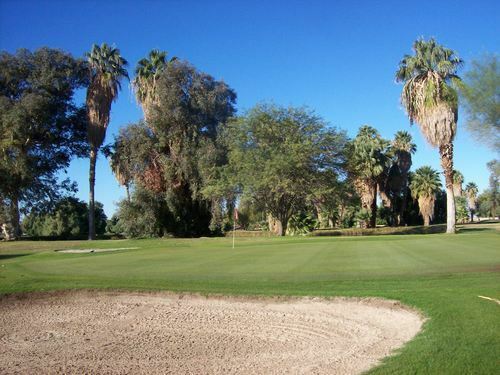 I would think things are pretty good during the winter like other low desert courses in Arizona and the Coachella Valley. I could see this course looking better in another month or so, but right now it has some issues. 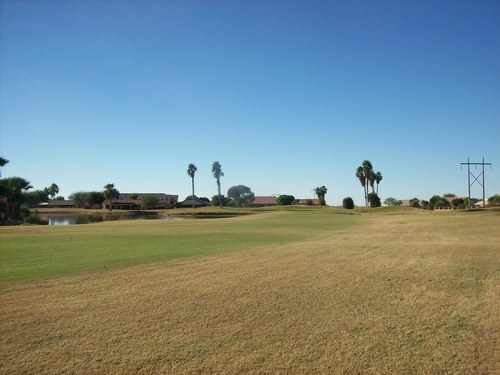 The fairways looked pretty good from afar and I would guess the course isn’t far removed from its overseed. The grass is green, but very shaggy and deep in some places, so it provided no roll-out and sometimes the ball would even sit down like in very thick rough. The rough is shaved-down dormant winter bermuda, so I found it easier to hit from than many fairway lies. The greens also appear to be coming out of maintenance because they are very, very shaggy. The new grass hadn’t come in very consistently and they clearly hadn’t been mowed in a few days. They were not as slow as they looked, but very bumpy. 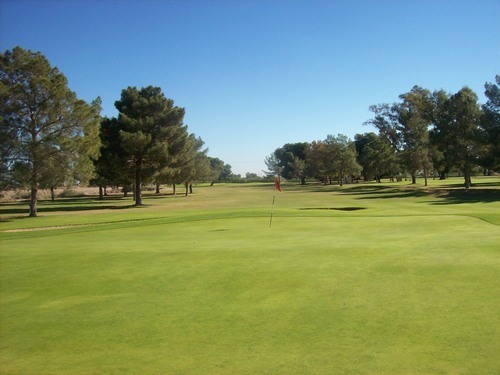 It was pointless to try and seriously read any consistent breaks or speed or fully appreciate any interesting contours of the green complexes. I was in a couple of bunkers. One was okay and the other was just hard packed, terrible sand. 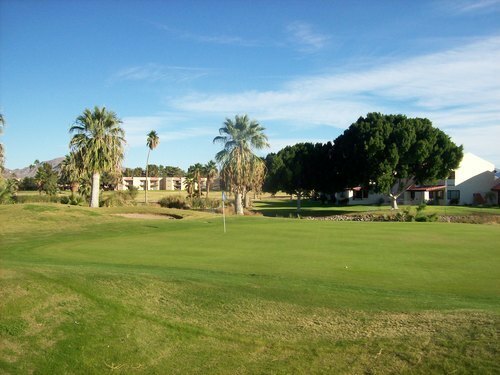 There’s no doubt I would have enjoyed Mesa del Sol more if it were in better shape. Again, though, I would say it’s not worth going too far out of your way for. 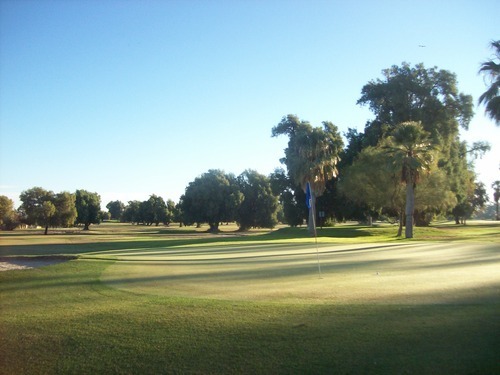 Yuma is just not a golf destination. They have a number of courses there to consider while in town, and that’s good to know.